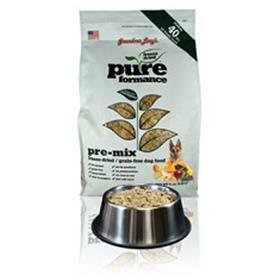 re already preparing food for your dog, Grandma Lucy's Pureformance, Grain-Free Pre-Mix is the perfect addition to your good food recipes. Whether your dog requires a more unique protein or just a variety of meats, the Artisan Pre-Mix will save you the time of preparing the fruits and vegetables for their diets. Simply measure out your dog's desired amount of Pureformance Pre-Mix, mix with equal amounts of water, add in your dog's favorite protein and serve - it's that simple!